Is there really any better gift than that of the limitless wisdom you obtain while roaming this vast, beautiful world? So many treasures are yet to be discovered. Below, the list aims to show the top 5 most elegant tips for international travelers. Keeping notes or writing down your impressions in a diary or simply in your Google Docs might seem like a waste of efforts. That’s especially if you are not a professional blogger. However, there is a much deeper magic to tracking down some of the things which have impressed you the most on your international trip. Opening the notes you took after you have got back home will take you to those deepest parts of your own Self, which are so hard to reach otherwise. Whatever you write down as an impression during your journey can literally change your perspective on life. That’s just something you need to get a taste of, as words are powerless to describe the rewards. On the other hand, there’s also a much more practical perspective to keeping a diary. You can organize your trip much better. Furthermore, you can also keep track of your daily costs, which is extremely useful if you are on a budget. Nevertheless, there are numerous locations and contacts which you can easily lose if you don’t have them written anywhere – be it on your phone or in a notebook. You notice that old couple holding hands in the middle of the crowded street? Or your mind fills with inspiration with the sight of the small local fruit and veggie market? All the little, seemingly minor details which catch your attention while on the road will vanish in some time ahead. But if you capture these with your camera, you can go back to those emotions which were triggered as you were exploring the view. As time passes, you often find some of your best masterpieces hiding among these “meaningless” pics. The moments which you managed to capture can serve you a good job for years to come. While you are out of your homeland, you must be always prepared for unexpected twists and turns. The ATM might be broken, you can lose your credit or debit card, or you can even wake up after a tough night to find your cash has been all spent out. Just do it like a pro - always keep some extra cash hidden at a place, where only you can reach, such as a pair of socks, your bag with underwear, or, oh well - everybody has his own top secret favorite place to sneak some white cash for black days. They say if you want to understand a culture you need to get a taste of their national cuisine. So no, it is not all about the super fancy local restaurant which got the most likes and shares and TripAdvisor positive reviews. It is those little street food huts and booths, where you can see people of all ages prepping unique, local food. In most cases, getting a taste of the local food will not cost you a fortune but exactly the opposite. Whether it’s fried grasshoppers, a banana stew, or some unknown specialty whose ingredients you can’t even recognize, it will be worth it. Make your international journey invaluable, eye-opening, and unforgettable through the food you eat and the experience it brings you. Embody the attitude of Anthony Bourdain, one of this century’s true explorers of local food and culture. You might be the type of person who is a fan of a good and deep sleep with long and lazy mornings which gradually turn into time for lunch. But since you want to have the best experience with international traveling, waking up early will shoot you miles ahead. 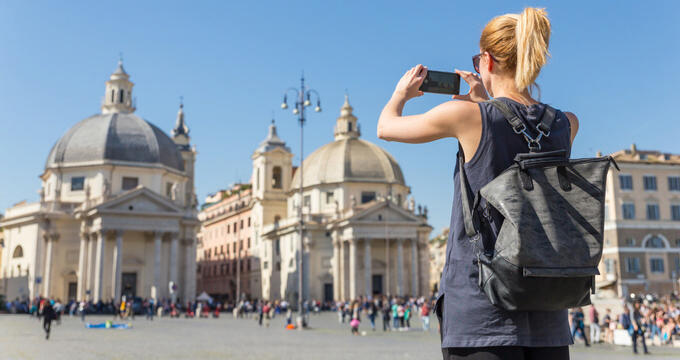 Less crowded cultural monuments and museums, less crowded public transport, and generously more time to explore and see more – that’s just part of the gains from setting an alarm and hitting the road early while you are abroad. Always remember that international traveling requires you to be well-prepared for every possible situation. It is easy to stay on the bright side if you keep in mind the tips listed above.